Yaro, so many share your grief and loss and pain. It’s obvious your dad loved you as unconditionally as you loved him. When you’re lonely and you aren’t too hungry or the barks or nuzzles just don’t help, just listen to the wind, feel the breeze in your face, it’s your dad standing by you, a team/partnership/love like this bond cannot be broken, it will feel different, but he’ll always be there, just as you would for him, I truly believe this. You are his shining example of all that is good. God bless Officer Tonn, his family, his LEO family and his boy, Yaro. Please keep us updated on how Yaro and Officer Tonn’s family are doing from time to time. This story has brought so many together from all over, it’s hard to not care about their future. God be with you all. Thank you for your kind thoughts, as you remember Officer Kevin, his family and Yaro. Yaro now lives with Kevin’s cousin, also an officer with Galt P.D. Kevin and his cousin roomed together for a year or so, before his cousin got married; so Yaro knows him very well. This has probably made Yaro’s adjustment easier, as he doesn’t have to live with a stranger. Kevin’s cousin has two other German Shepherds, so Yaro has constant company, while the cousin is at work. Kevin’s extended family all love Yaro dearly and he gets alot of attention and love when out visiting family. All applications are subject to a background check for authenticity and integrity. By submitting this application you agree that all information is correct and truthful to the best of your knowledge. 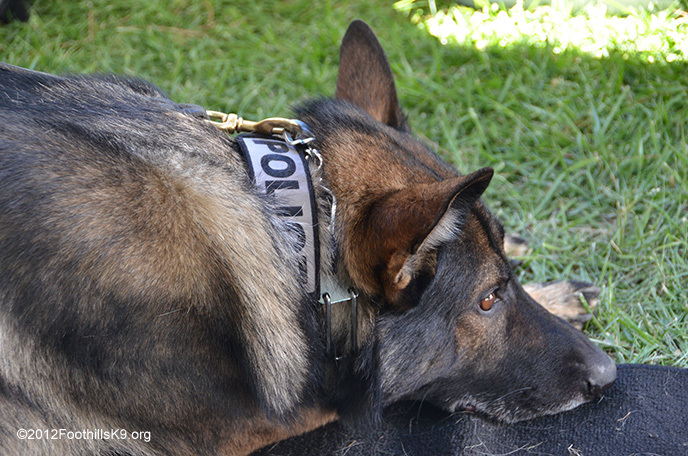 The Foothills K9 Association is a non-profit organization established for the sole purpose of promoting training, safety and the health of law enforcement K9’s. As K9 Handlers, we respect and care for our K9 partners and we are dedicated to supporting them throughout their career and retirement. Made with Love by: GMP&THREE LLC | Dedicated to H.S.